Hand splints are used to prevent muscular hyperactivity in adult poststroke patients. Hand splints are used by occupational therapists as a method to reduce spasticity of the upper extremity following stroke. There are numerous approaches to the manufacture of static splints that can be found in the literature such as Bobath's neurodevelopmental treatment (NDT) approach and rood sensorimotor splint. Hand splints are used as a method of reducing the increased muscle tone of the upper extremity following stroke. Muscle stretching is becoming a very common practice in the rehabilitative management of spasticity. It includes several types of muscle stretching such as passive stretching, active stretching and prolonged stretching, isotonic stretching, and isokinetic stretching. The effects of stretching on spasticity may be explained by a change in the excitability of motoneurons supplying the spastic muscle. A few studies have examined that the application of stretch decreased motor neuron excitability and may be beneficial to decrease spasticity. Neurophysiologic rationale suggested that prolonged stretch in the fully elongated range may lead to stimulation of the neurotendinous spindle of the intrafusal fiber. This may inhibit the spastic muscle. The aim and objective of this study were to investigate the difference between the effects of hand splinting and stretching exercises, in reducing spasticity as well as improving hand functions in poststroke hemiplegia. A total of 30 poststroke hemiplegic patients of age 36–62 years were enrolled for the study. There were 11 males and 4 females in splinting group of age 40–61 years with a mean age of 48.60 years. There were 10 males and 5 females in a stretching group of age 36–62 years with mean age of 50.93 years. The study duration was of 8 months, and the research design was two-arm comparative interventional study. The study was conducted adhering to the principles of the Declaration of Helsinki, and written informed consent was sought from the patients. Inclusion criteria comprised first poststroke adult hemiplegia, aged between 35 and 65 years, either right or left hemiplegia, muscle tone of the affected upper extremity at wrist and fingers ≥2 according to Modified Modified Ashworth Scale (MMAS). Exclusion criteria comprised the presence of cognitive or perceptual impairments, any cutaneous or joint pathology or contractures, use of any antispastic medication, or hand splints before enrollment in the study. Mini-Mental State Examination to rule out any cognitive or perceptual impairment. 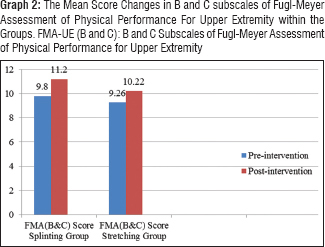 MMAS and B and C subscales of Fugl-Meyer Assessment of Physical Performance for Upper Extremity (FMA-UE [B and C]) were used as assessment tools as well as outcome measures for the study. A total of 30 patients fulfilling the inclusion criteria were enrolled in the study following written informed consent from the patients. Consecutive sampling was followed by recruiting all odd number patients in the splinting group and all even number patients in the stretching group. Designing and fabrication of resting hand splint for the splinting group were based on biomechanical principles and Bobath's principles. A static wrist-hand splint was fabricated of aluminum sheet padded with plastazote. In static resting wrist-hand splint, our main aim was to maintain all digits in extension at metacarpophalangeal, proximal, and distal interphalangeal joints, wrist in neutral or slight dorsiflexion with thumb in palmar abduction. The splint was designed to stabilize the proximal and distal interphalangeal joints based on Bobath's reflex inhibitory pattern. The forearm and wrist cuffs and Velcro straps were used to stabilize the forearm and wrist based on three-point pressure principle. The patients of the splinting group were given a resting hand splint to be worn for 10–12 h intermittently every day for 6 weeks. Splint wearing schedule was supervised by the researcher based on the interview with the patients' caregivers [Figure 1]a.
Static stretching was carried for patients in stretching group 3–4 times a day and 5–6 days in a week for 6 weeks. Passive sustained stretching was carried out in a seated posture as per Bobath's reflex inhibitory pattern. The patient was positioned comfortably in a chair or a wheelchair, and the wrist joint was moved through a full range of motion by using a prolonged slow, sustained stretch technique to avoid eliciting a quick stretch reflex. The hand was held in the fully extended position or as much as possible (within patient's tolerable range and gradually advancing to full ranges over a couple of sessions) for approximately 60 s for each of five repetitions in each therapy session [Figure 1]b. The test parameters were compared before and after therapy. Statistical analyses were done using the statistical package for the social sciences version 16.0 package (SPSS Inc. 233 South Wacker Drive, 11th Floor Chicago, IL, USA). Statistical tests were used with a level of significance set at P < 0.05 at the outset of the study. The raw scores of preintervention and postintervention of both the outcome measures (FMA-UE and MMAS) were calculated in both the groups. The changes in both outcome measures in splinting and stretching group were analyzed using the Wilcoxon signed-rank test. The Mann–Whitney U-test was used for analyzing the comparative efficacy between the groups. [Table 1] shows the results of Wilcoxon signed-rank test for MMAS of wrist flexors and finger flexors and FMA-UE (B and C) scores of splinting and stretching groups, which indicates a significant improvement in both the groups. [Graph 1] shows that there is a significant improvement in MMAS of wrist flexors and finger flexors in both the splinting and stretching groups. [Graph 2] shows that there is a significant improvement in FMA-UE (B and C) scores of both the splinting and stretching groups. [Table 2] shows the results of the Mann–Whitney U-test for MMAS of wrist flexors and finger flexors and FMA-UE (B and C) scores of splinting and stretching groups, which indicates there is no statistically significant difference of improvement between splinting and stretching groups. The present study was designed to compare the two treatment modalities, i.e., hand splinting and stretching exercises for reducing spasticity and improving hand function in poststroke hemiplegia, to find the effects of these modalities on spasticity of wrist flexors and finger flexors and improvement in hand function in stroke survivors. The result of the outcome measure used for the spasticity of wrist flexors, i.e., MMAS scores showed that there is a significant reduction in the spasticity in splinting and stretching groups (within the groups). This result finding is consistent with the previous study done by Pizzi et al., 2005 where a significant improvement of wrist passive range of motion with greater change in extension than flexion, and reduction of spasticity, pain, and spasm was observed. This result finding is also consistent with the previous study done by Mortenson and Eng 2003 where stretching was used in spasticity to normalize muscle tone, to maintain or increase soft-tissue extensibility, to reduce pain, and to improve function. This result finding is also consistent with the previous study done by Rose et al. 1987 where 30 patients with spastic wrist flexors resulting from a diagnosed stroke not more than 6 months' poststroke. Participants were randomly assigned to either of two experimental groups (predominantly dorsal or predominantly volar static orthosis) or to the control group (no orthosis). The patients in the intervention groups had significant increases in the passive range of wrist extension and a decrease in hypertonicity compared with the control group. The result of MMAS score at wrist flexors between the groups statistical analysis using the Mann–Whitney U-test showed that there is no significant difference in improvement between the splinting and stretching groups. Although the splinting group participants showed more improvement than the stretching group and this improvement in MMAS score between the splinting and stretching groups may be due to the effect of resting hand splint for longer time, which maintains proper alignment and proper positioning of the wrist and hand. This result finding is also consistent with the previous study done by Katalini et al., 2011 where the immediate effects of stretch on spasticity were investigated by pooling the data from four studies. The long-term effects of stretch on spasticity were investigated by pooling the data from two studies. No study measured the short-term effects of stretch on spasticity. The results of this review indicate that stretch does not have clinically important effects on joint mobility in people with or at risk of contractures. There is little or no effect of stretch on pain, spasticity, or activity limitation in people with neurological conditions. The result of the outcome measure used for the spasticity of finger flexors, i.e., MMAS score showed that there is a significant reduction in the spasticity in splinting and stretching groups (within the groups). This result finding is consistent with the previous study done by Adrienne and Manigandan 2011, hand-splint prescription following stroke was found to be a common practice among occupational therapists who perceive splints to be quite effective. A custom-made, volar forearm-based wrist-hand splint is the preferred splint among therapists to achieve a number of clinical aims such as improving range of motion, stretching soft-tissue contractures, and reducing spasticity in the upper extremity. This result finding is also consistent with the previous study done by Langlois et al., 1991, where nine adults with hemiplegia with a finger spreader splint and found that the spasticity was reduced. Prolong stretch resulted in a significant reduction in spastic hypertonus in wrist and finger flexors. The mechanism leads to beneficial effects due to stretch receptor fatigue or adaptation to the new extended position. The result of MMAS score of finger flexors between the group statistical analysis using the Mann–Whitney U-test showed that there is no significant difference in improvement between the splinting and stretching groups. Although the splinting group participants showed more improvement than the stretching group and this improvement in MMAS score between the splinting and stretching groups may be due to the effect of resting hand splint for longer time, which maintains proper alignment and proper positioning of the hand. This result finding is also consistent with the previous study done by Langlois et al., 1991 where nine adults with hemiplegia with a finger-spreader splint and found that spasticity reduced more in the group who had wearing scheduled for 22 h a day, as compared to the group who had 6 h a day wearing schedule and 12 h a day wearing schedule. Since, in this study, splint-wearing schedule was 12 h considering the feasibility of the participants such as routine conventional therapy, their engagement in activities of daily living (ADL). This could have caused no significant difference between the two groups. This result finding is also consistent with the previous meta-analysis done by Foley et al., 2010 in which six randomized controlled trials were identified examining the benefit of splinting. Most of the studies failed to support the benefit of splinting in reducing spasticity of avoiding contracture. It has been suggested that short treatment periods, generally 4–6 weeks and underpowered studies may have contributed to the negative findings. In the same way, in this study, the protocol of wearing splint was also only 6 weeks which could cause the impact of splinting less effective. The result of outcome measure used for measuring the effect on hand function, FMA-UE (B and C) showed significant improvement in hand function in splinting and stretching groups using the Wilcoxon signed-rank test for within the group statistical analysis. This result finding is consistent with the previous study done by Pitts and O'Brien 2008 where custom splints were applied to maximize functional outcomes by keeping peripheral muscles and joint systems at a functional length. This result finding is consistent with the previous study done by Mortenson and Eng 2003 where stretching was used in spasticity to normalize muscle tone, to maintain or increase soft-tissue extensibility, to reduce pain, and to improve function. The statistical analysis between the splinting and stretching groups using the Mann–Whitney U-test for FMA-UE (B and C) showed that there is no significant difference in improvement in hand function. This result finding is consistent with the previous study done by Shamili et al. 2010 where the aim of this study was to compare the effects of using splint or botulinum toxin injection on spasticity, range of motion, and upper extremity function in which as a result all outcome measures improved in each group; however, the differences between two groups were not significant. This result finding is also consistent with the previous study done by Barnes, 1998 where the application of splints and casts can prevent the formation of contractures in the spastic limb, and serial casting can improve the range of movement in a joint and thus hand functions also improved. From previous studies and the current result, it can be hypothesized that due to the application of resting hand splint or muscle stretching in stroke survivors, there is a significant reduction of the spasticity which in turn improves the hand function but without any significant difference. This study concluded that both hand splinting and stretching exercises are effective in reducing spasticity and improving hand functions in poststroke hemiplegia. However, the recovery of splinting group patients was clinically better than the stretching group, although the difference was statistically not significant. Bastier-David A, Boyer F, Belassian G, Potet A. Hand splints and spasticity in hemiplegic patients. Ann Phys Rehabil Med 2011;54:62-68. Langlois S, Pederson L, MacKinnon JR. The effects of splinting on the spastic hemiplegic is hand: Report of a feasibility study. Can J Occup Ther 1991;58:17-25. Bovend'Eerdt TJ, Newman M, Barker K, Dawes H, Minelli C, Wade DT, et al. The effects of stretching in spasticity: A systematic review. Arch Phys Med Rehabil 2008;89:1395-1406. Selles RW, Li X, Lin F, Chung SG, Roth EJ, Zhang LQ, et al. Feedback-controlled and programmed stretching of the ankle plantarflexors and dorsiflexors in stroke: Effects of a 4-week intervention program. Arch Phys Med Rehabil 2005;86:2330-2336. Rochester L, Vujnovich A, Newstead D, Williams M. The influence of eccentric contractions and stretch on alpha motoneuron excitability in normal subjects and subjects with spasticity. Electromyogr Clin Neurophysiol 2001;41:171-177. Abolhasani H, Ansari NN, Naghdi S, Mansouri K, Ghotbi N, Hasson S, et al. Comparing the validity of the modified Modified Ashworth Scale (MMAS) and the Modified Tardieu Scale (MTS) in the assessment of wrist flexor spasticity in patients with stroke: Protocol for a neurophysiological study. BMJ Open 2012;2. pii: e001394. Foreman MD, Fletcher K, Mion LC, Simon L. Assessing cognitive function. Geriatr Nurs 1996;17:228-33. McPherson JJ, Becker AH, Franszczak N. Dynamic splint to reduce the passive component of hypertonicity. Arch Phys Med Rehabil 1985;66:249-252. Pizzi A, Carlucci G, Falsini C, Verdesca S, Grippo A. Application of a volar static splint in poststroke spasticity of the upper limb. Arch Phys Med Rehabil 2005;86:1855-1859. Mortenson PA, Eng JJ. The use of casts in the management of joint mobility and hypertonia following brain injury in adults: A systematic review. Phys Ther 2003;83:648-658. Rose V, Shah S.A comparative study on the immediate effects of hand orthoses on reduction of hypertonus. Aust Occup Ther J 1987;34:59-64. Katalinic OM, Harvey LA, Herbert RD. Effectiveness of stretch for the treatment and prevention of contractures in people with neurological conditions: A systematic review. Phys Ther 2011;91:11-24. Adrienne C, Manigandan C. Inpatient occupational therapists hand-splinting practice for clients with stroke: A cross-sectional survey from Ireland. J Neurosci Rural Pract 2011;2:141-149. Teasell RW1, Foley NC, Bhogal SK, Speechley MR, An evidence-based review of stroke rehabilitation. Spring: Top Stroke Rehabil 2003;10:29-58. Pitts DG, O'Brien SP. Splinting the hand to enhance motor control and brain plasticity. Top Stroke Rehabil 2008;15:456-467. Shamili A, Amini M, Forogh B, Qorbani M. Botulinum toxin injections or application of splints: Impact on spasticity, range of motion and function of upper extremity in chronic stroke patients. Iran J Pharmacol Ther 2010;10:11-16. Barnes MR. Management of spasticity. Age Ageing 1998;27:239-245.